The past year has seen quite a few new four wheeling videos hit the market. Some were good, and some were worse than reruns of the Brady Bunch Visit Hawaii episode. Well 2005 has kicked off with a bang with the release of RP Films' "Haulin' or Crawlin' II" released in February. The second video in the Haulin' or Crawlin' series, this video has a lot to live up to as HC1 was an excellent video. As an active participant of the Pirate Bulletin Board, Rat Pat "Yotafilmer" asked for advise from PBB members to make the already great HC1 even better. It seems he took much of the advise, as RP's latest release is just plain awesome. When I received my DVD, I immediately popped it into my trusty laptop, and fired it up. I was pleasantly surprised to find that RP had actually listened to the PBB audience, and gives you the option to watch the video with or without music. This is a great option for those who don't like the fast paced music commonly found in these types of videos. Speaking of music, RP really kicked the music up a few notches this time, as I found the music selections to be much more enjoyable than previous movies. While all the music is from groups I've never heard before, they were good selections that flowed well with the action. The music wasn't all blaring punk rock that rattled my skull, either. The movie starts out with Jason Paule and Travis Wadeson piloting their Twisted Customs rig through some of the toughest rock crawling courses in the professional rock crawling circuit. RP shows some of the top teams in the sport running in competitions and running trails in their comp buggies. It's a refreshing change to see some good trail action - especially watching guys like Tracy Jordan negotiate a trail - without cones. After watching a slew of top drivers strut their stuff, the real fun begins. HC II pumps out some of the best trail action I've ever seen in one video. 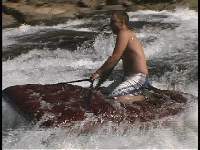 From Toyotas bashing through the Little Sluice Box, to Rookie of the Year Peter Mazzoni riding an air mattress down class IV rapids in Fordyce Creek. I personally enjoyed the trail footage the most, as it reminded me of why I enjoy wheelin' so much in the first place - to hang out with my buddies, and beat my junk, and enjoy the outdoors. So is this the best video out there? Quite possibly. Check out the HC2 trailer here, and check it out for yourself.